Explore over 300 color coded, highly detailed wine regions of France. These maps combine detailed wine region and reference information with a shaded relief background in order to showcase the characteristic physical geography of a particular region, state, or country. Explore over 300 color coded, highly detailed wine regions of France. These maps combine detailed wine region and reference information with a shaded relief background in order to showcase the characteristic physical geography of a particular region, state, or country. All VinMaps are printed on high quality, satin matte finish paper. Perfect to mount in your wine cellar, winery, library, or office. BEST ANSWER: I agree with the previous answer to this question. 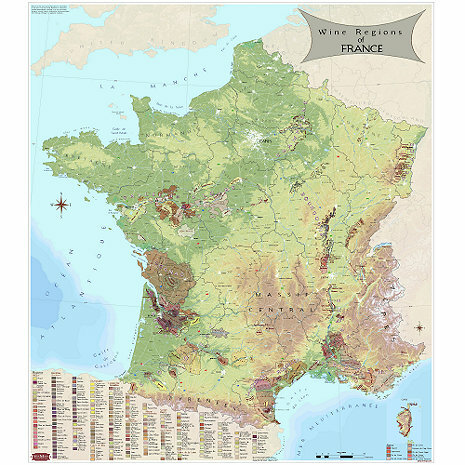 The Wine Map of France shows 300+ wine regions of France and is beautifully detailed. I framed mine in a mahogany frame and it looks lovely. The Wine Map of France enables you to explore over 300 color coded, highly detailed wine regions of France. If you are looking for wine bottles tags, we offer several. Is this map made of a strong material or does it need to be put inside a frame? BEST ANSWER: It is printed on high quality, satin matte finish paper. It does not need to be put inside a frame but you may choose to do so. This item is made of a high quality, satin matte finish paper. What is the name of a good red wine ? These are a great addition to the walls of our wine cellar that we use for tastings. We and our guests love studying the wine regions of the different countries posted on the walls. And we can ID where the wine we are drinking if from. This was a gift for my husband, who is a huge wine enthusiast. We were in France this summer and he became very interested in French wines. Now he has a visual guide to various areas that we can explore when we return to France in the future. He loved it! Was looking for a wine map of France and couldn't really find one on any other site. At first I thought it was a little pricey, but now that I received the map, it is quite large and beautiful. It's a great addition to our dining room. I wouldn't say you can hang it up without a frame. The paper is a little too flimsy for that. Food for thought, framing it was very expensive!! I didn't realize that when I bought it, but I'm giving it to my husband for his birthday and it is definitely a conversation piece. He has traveled to almost all the wine regions in France so this is great. I didn't give it to him yet, but I can't wait! Very detailed including color-coordination of each region. It's just what I wanted. My reason for rating four stars vs. five stars is that it requires custom framing, which added a few dollar$. Enjoy!